The War of 1812 bicentennial, which wraps up early next year, offered many educational and fun events. But something was missing: a classic movie we could watch as part of the commemoration. World War I, whose centennial started this year, inspired several films that transport us to a bygone era in a way that only Hollywood can do. Those movies include All Quiet on the Western Front, The African Queen, Lawrence of Arabia and Gallipoli. The roll call of World War II movies is so long it may encompass more hours than the war itself, and trying to pick out the most noteworthy is sure to cause a fight when you have contenders such as Saving Private Ryan, The Bridge on the River Kwai, The Longest Day, Schlinder’s List, The Great Escape and John Wayne’s Sands of Iwo Jima. The Civil War has Gone With the Wind, the highest-grossing film of all time, adjusted for inflation, according to website Box Office Mojo. The Civil War also gave us Glory, Shenandoah, Lincoln and Gettysburg. The War for Independence hasn’t fared as well in movies, but nonetheless has a respectable showing. Journal of the American Revolution, an online publication, compiled a list of the Top 10 Revolutionary War movies. On the list are Drums Along the Mohawk, Johnny Tremain and John Adams, an HBO series. The musical 1776 didn’t make the cut for some reason, but should be included. An Internet search for “War of 1812 movies” turns up little more than The Buccaneer, a largely forgotten 1958 flick (a remake of a 1938 movie) about the 1815 Battle of New Orleans, starring Charlton Heston as Maj. Gen. Andrew Jackson and Yul Brynner as pirate Jean Lafitte. We can do better than that. We can do the Battle of Lake Erie. 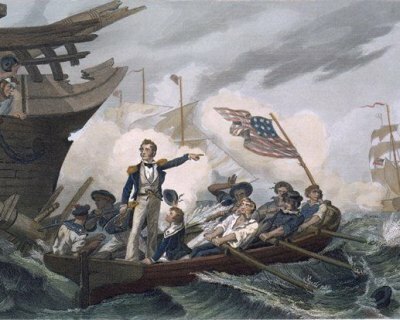 The engagement between British and American ships on Sept. 10, 1813, offers dashing young naval officers, spectacular scenes of sailing ships blasting broadsides at each other and a tense escape by the American commander, who would later return to the action and claim victory, then utter one of the most memorable lines in American history. The approximately three-hour battle pitted U.S. Master Commandant Oliver Hazard Perry (1785-1819) against British Cmdr. Robert Heriot Barclay (1786-1837). Each side had two large ships and several smaller ships. On Perry’s command vessel, the Lawrence, hung a flag that read: “Dont Give Up The Ship” (no apostrophe). Reports of the battle are so vivid and the clash of navies so violent that the movie’s director can show the horrors of battle while still hewing close to the history. Perry’s crew included several African-American seamen. Perry ordered one of them, Seaman Cyrus Tiffany (possibly a fifer in George Washington’s army), to take a musket and bayonet to the sleeping deck to persuade anyone lingering there to join the fight. As the battle wore on, the Lawrence was nearly destroyed, 80 percent of the crew was dead or wounded, and not one of the ship’s guns was usable. That would seem like a good time to surrender, but Perry grabbed the “Dont Give Up The Ship” flag, hopped into one of the Lawrence’s small boats with four unwounded seamen and was rowed toward the other big U.S. ship, the Niagara. The British fired at the rowed boat and cannon balls splashed around it but did no damage. The battle ended British threats to states bordering the Great Lakes, and Perry’s ships transported Harrison’s troops to Canada, where the future president scored victories over the British Army and Indian leader Tecumseh (more exciting battle scenes). This was one of the first joint Army-Navy operations in U.S. history, according to A Signal Victory. The Battle of Lake Erie has the action. Now we just need the lights and camera. Help pick the leading roles for the Battle of Lake Erie movie. Like us on Facebook and submit your suggestions for the actors who should play three key characters. Below is a brief description of them. Oliver Hazard Perry: Had just turned 28 at the time of the battle (his birthday was Aug. 23). Born in South Kingstown, Rhode Island. Described as someone with a command presence, personal integrity, calmness under pressure, a dedication to duty, a quick temper that could shift to rage and an aloofness that distanced him from his men. Robert Heriot Barclay: Age 26 at the time of the battle (his 27th birthday would be Sept. 18). Born in Scotland. Lost his left arm in a sea battle with the French. Described as ambitious, brave, gallant, highly experienced in sea combat for such as young man -- but prone to miscalcuation. William Henry Harrison: Age 40 at the time of the battle. Born on Berkeley Plantation near Richmond, Virginia. He was plainspoken, unpretentious, courteous, friendly and good-humored, according to a description in The Complete Book of U.S. Presidents, by William A. DeGregorio (Barricade Books, 1993).